During the past season, the KTM RC16 – the MotoGPTM bike from KTM – has been causing something of a furor amongst the established brands. Almost straight out of the gate it was helping riders to score world championship points and land top 10 spots. And exactly 10 years ago the KTM 1190 RC8, one of KTM’s first superbikes, went into production, causing quite a stir before it even went on sale. “KTM goes street” – this slogan is a good description of the recent years in KTM’s history. In 2003, KTM made their entry into Grand Prix sport with a 2-stroke 125cc machine. 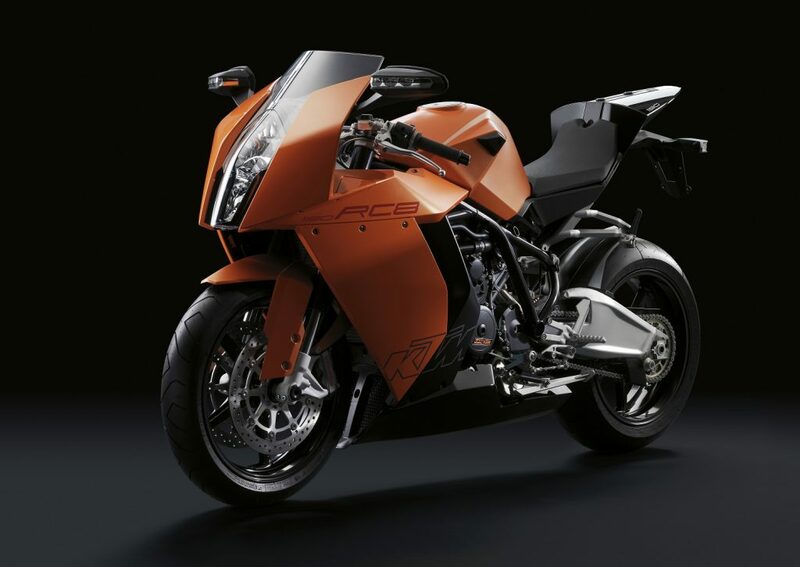 The same year, the “990 RC8” was unveiled at the Tokyo Motor Show. This concept bike demonstrated KTM’s vision of creating the ultimate machine for ambitious street riders. KTM’s desire to position itself in future as a manufacturer of large-capacity street bikes was clear to all. The state-of-the-art LC8 V2 engine would provide the basis for these street bikes. Back then, many people struggled to believe it was even possible, and yet it became a reality. The vision of 2003 went into production five years later. In November 2007, KTM CEO Stefan Pierer marked the beginning of a new chapter in KTM’s history at the leading international motorcycle trade fair, the EICMA in Milan, when he unveiled the KTM 1190 RC8 production model. “The KTM 1190 RC8 perfectly embodies the accumulated know-how and the sporting passion of our development team. It also shows that KTM is capable of implementing our chosen product strategy and successfully carrying forward the clear philosophy of our brand in the road segment too,” commented Stefan Pierer at the unveiling of the KTM 1190 RC8 at the Milanese trade show. At the heart of the KTM 1190 RC8 lay an entirely new development: a super sporty 2-cylinder engine based on the proven LC8 range. Back then, the engine generated a peak output of 155 hp and a maximum torque of 120 Nm, allowing it to deliver a superior level of performance. A steel tubular trellis frame, the highest quality suspension and brake components, as well as extraordinary technical solutions, such as positioning the exhaust system under the vehicle, made the KTM 1190 RC8, which weighed under 200 kg even with a full tank, a superbike in the truest sense of the word. KTM also forged its own path when it came to the appearance of the new model. The concept, created by head designer Gerald Kiska, pursued the idea of simply and visually integrating high quality technology into the overall form. The KTM 1190 RC8 is a true KTM with racing in its genes; that much is plain to see. What’s more, the tests conducted by the trade press turned out to be a particularly interesting read. KTM’s foray into high capacity 2-cylinder machines with the first “Made in Austria” superbike had quite clearly been a great success. A sportier, lighter, and more powerful version soon followed in the shape of the KTM 1190 RC8 R. The KTM 1190 RC8 R was an excellent basis for use in different race series. If you wanted to get out onto the race track, KTM PowerParts was the place for you – here you could find all kinds of accessories, from tire warmers and brake components to clothing made from carbon, covering all the potential needs of sports and racing riders. And for those looking to increase the performance of their bike on the track, there was no longer any need to go to a tuner – three different KTM performance kits were available straight from the dealers. The KTM 1190 RC8 R Club Race Kit, which could be fitted by any dealer in just a few hours, increased the performance by 10 to 180 hp. The Super Stock Kit increased the performance even more, while the Superbike Kit allowed riders to compete in national superbike championships with a good chance of success. The factory racers prepared by Stefan Nebel and Martin Bauer to near-series IDM regulations even managed to produce 190 hp, weighed just 181 kg with a full tank, and achieved a top speed of nearly 300 km/h! But even without tuning, the KTM 1190 RC8 R offered impressive performance: a 287-km/h top speed, acceleration from 0 to100 km/h in 3.2 seconds, and from 0 to 200 km/h in just 8.2 seconds. The KTM 1190 RC8 R even left the top dogs from Bologna in the dust. It was not unreasonable to question whether a 200-hp superbike with the road performance of the KTM 1190 RC8 really belonged on the public roads, which is why there was no successor to the KTM 1190 RC8. Nevertheless, the KTM 1190 RC8 still fascinates people ten years later. The ultra-sharp Kiska design, the handlebars, footpegs, levers, and even the rear part and the chassis are all adjustable. The frame and swingarm are tiny works of art and even the weld seams are a feast for the eyes. It leaves you with fond memories of a great bike. Extraordinary, trend-setting and above all: extremely fast.